43AD. At the far edges of the Roman Empire lies a land of powerful Druids and warrior queens. A country Julius Caesar had tried and failed to conquer a hundred years ago. A place which lies tantalisingly close to the Roman Empire’s grasp and has almost mythic status: Britannia. The Romans’ arrival will forever change the lives of the Celts and Druids. Under General Aulus, 400 ships containing 20,000 men land on Britannia’s shores in the name of the Roman Emperor Claudius. They will take the island and anything they want from it. Britannia will be conquered. Britannia will be civilised. But since when did anyone want to be civilised? Why invade a foreign land? Why fight for your home and your gods? These are the two questions at the heart of Jez Butterworth’s approach to the story of the Roman invasion of Britain in 43AD. In Jez’s unique hands, this becomes a tale of faith systems clashing, of families torn apart, of mystic men and fearsome queens. A tale told with humour and heart. As well as epic drama and violence. Drama on Sky is about the unexpected, the visceral and the memorable, it’s about stories told in a way you won’t find anywhere else. As you would expect from the brilliant writer behind Spectre and multiaward-winning plays Jerusalem and The Ferryman, Britannia delivers. It’s a fun, thought-provoking, emotional ride into a very special world. Produced by Vertigo Films in association with Neal Street Productions, Britannia was created by Jez Butterworth (Spectre), Tom Butterworth (Tin Star) and James Richardson (Monsters). Britannia will launch on Sky Atlantic and NOW TV, with all episodes available in Ultra HD from Thursday 18 January. We truly hope everyone enjoys kicking off the New Year by diving deep into our nation’s dark, unruly past, in a journey that will take you all the way to the underworld and back. Thank you for watching. Son to Pellanor, Phelan is the de facto heir to the Cantii throne and his right-hand man. More strategic and rational than his wrathful father, he attempts to add more diplomacy to his father’s leadership. However, in Cantii terms this has done nothing for his own standing, and many in the tribe see him as a weak proposition for the Cantii throne. This outrages his wife, Amena, whose only attraction to Phelan is her own path to the crown, and whose attempts to lead his ambition have thus far led to nothing. As a result their marriage is an unhappy affair, with Amena emasculating him at any opportunity – not that he’d give her the satisfaction of knowing she gets to him. The arrival of Ania, a Regni captive, finally injects a little adventure into his life. Myanna Buring (Ripper Street), Russell Tovey (Being Human), Julian Rhind-Tutt (The Hour) and David Wenham (Top Of The Lake) lead a strong ensemble cast in Jimmy McGovern’s epic new series, Banished, which starts filming north of Sydney this April for broadcast on BBC Two in 2015.
International award-winning independent production companies RSJ Films (Accused, The Street) and See-Saw Films (Top Of The Lake, The King’s Speech, Shame) have joined forces for the first time to co-produce Banished, Jimmy McGovern’s fictional seven-part series loosely inspired by events in the 18th century when Britain established a penal colony on the other side of the world. The series has been co-commissioned by BBC Two and BBC Worldwide Australia and New Zealand. This ambitious co-production charts the lives, loves, relationships and battle for survival of a group of convicts, the soldiers who guard them and the men who govern them in the early days of this settlement. It is here that the convicts transported on the First Fleet and their masters are waking up to another sweltering hot day in a place where anything can happen and death stalks everyone. With supplies running out and the group ill-equipped for life on this inhospitable shoreline, who will survive the next 10 days? Australian actor David Wenham (Top Of The Lake) plays Governor Arthur Phillip, a pragmatic idealist who hopes to turn this ramshackle settlement from penal colony to land of opportunity for all, while his nemesis Major Ross, played by Joseph Millson (Holby City), thinks the only chance of survival is to rule with an iron fist. Yet all that seems unshakeable are the passionate bonds of love and friendship forged between convicts: Elizabeth Quinn (Myanna Buring), Tommy Barrett (Julian Rhind-Tutt) and James Freeman (Russell Tovey). But, before long, this shared devotion is destined to challenge the very doctrines on which the fledging colony has been founded. Also featuring in this epic series about human courage and endeavour, love, loss and impossible choices are Ewen Bremner (Accused) as the pious Reverend Johnson, with Genevieve O’Reilly (The Honourable Woman) as his selfless wife and Brooke Harman (Dance Academy) as Deborah Governor Phillip’s housekeeper. Orla Brady (Strike Back) plays intuitive convict Anne Meredith and Joanna Vanderham (The Paradise) is the dangerously beautiful convict Katherine McVitie. Rory McCann (Game Of Thrones) is the formidable felon Marston, whose skills as blacksmith are indispensable. Soldiers are played by Adam Nagaitis (Inbetweeners 2) as the loathed Private Buckley; Sergeant Timmins is played by Cal MacAninch (Mr Selfridge); Ryan Corr (Wolf Creek 2) is Private MacDonald and David Dawson (Peaky Blinders) is Captain David Collins. Other convicts are played by Nick Moss (The Mill) as hard man Spragg, David Walmsley (The Smoke) as Stubbins with Ned Dennehy (Blitz) as Letters Molloy, whose rare literacy is both a blessing and a burden. Banished is written and devised by Jimmy McGovern, and Shaun Duggan (Accused) has written episode five. Sita Williams is producer and she also executive produces alongside Roxy Spencer and Jimmy McGovern. Emile Sherman, Iain Canning, and Jamie Laurenson are executive producers for See-Saw Films. Brett Popplewell and Simon Hailey are co-producers. Banished directors are Dan Percival (Death Comes To Pemberley), who directs episodes one to three, and Australian director Jeffrey Walker (Jack Irish) directs episodes four to seven. Banished was commissioned by Ben Stephenson, Controller of BBC Drama Commissioning, and Janice Hadlow, the outgoing Controller of BBC Two, and is executive produced for the BBC by Polly Hill, Head of BBC Independent Commissioning. Natalie Edgar, Director of Television, leads the co-commission for BBC Worldwide Australia and New Zealand. It is the first local commission for BBC First, a new premium drama and comedy channel, to be launched on Foxtel in Australia this year. In New Zealand, it will be shown on UKTV. BBC Worldwide is the distributor of Banished. The series is due for broadcast on BBC First in Australia and on UKTV in New Zealand in 2015. BBC Two has given the green-light to Wipers Times, a a feature length movie about the satirical World War I magazine. TVWise first reported last November that the BBC was developing the project in conjunction with Trademark Films, although at the time it was unclear whether the project was being developed for BBC One or BBC Two. I have now confirmed that the film is being produced for BBC Two with Trademark eyeing theatrical releases in other countries. Steve Pemberton and Reece Shearsmith follow up the multi-award-winning Psychoville with an anthology of tales of the genuinely unexpected, under the working title Inside No. 9. What goes on behind closed doors on the street where you live? Inside No. 9 invites you into six very different No. 9s, where the ordinary and mundane rub shoulders with the extraordinary and macabre. From a grand country house where a game of ‘sardines’ leads to some chilling revelations in a wardrobe; to a very oddly haunted house; to the flat of an apparently happy primary school teacher who becomes the victim of a good deed; these unpredictable tales feature high comedy and claustrophobic horror by turns. Starring alongside Steve and Reece in various stories will be Gemma Arterton (Quantum Of Solace, Tamara Drewe), Conleth Hill (Game Of Thrones), Katherine Parkinson (The IT Crowd), Anna Chancellor (The Hour, Pramface), Anne Reid (Last Tango In Halifax), Tamsin Grieg (Friday Night Dinner, Episodes), Julian Rhind-Tutt (Green Wing, A Touch Of Cloth), Ben Willbond (The Thick Of It, Horrible Histories), Marc Wootton (Way To Go, High Spirits With Shirley Ghostman), Timothy West (Exile, Endgame), Sophie Thompson (Love Life, EastEnders), David Bedella (Jerry Springer – The Opera), Adam Deacon (Kidulthood, Adulthood), Edinburgh Comedy Award-winner Tim Key and many more. BBC Four has ordered a 75 minute one-off drama titled An Innocent Abroad about P.G. Wodehouse’s fall from grace and self imposed exile frome England. Tim Pigott-Smith, Zoe Wanamaker and Julian Rhind-Smith are set to star in the 75 minute film, which is due to star shooting on location in Belfast, Northern Ireland, later this month. 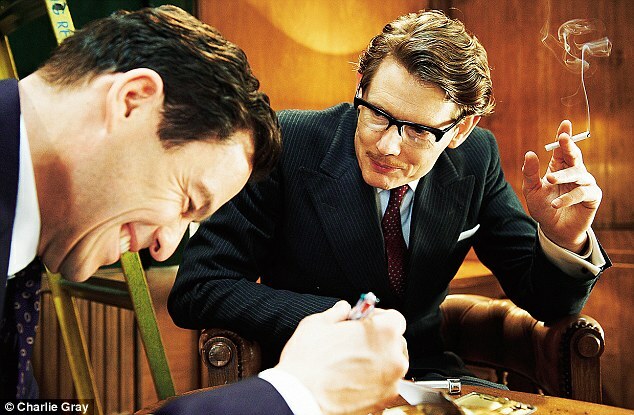 Written by Nigel Williams, An Innocent Abroad is set in the 1940s when Wodehouse, the writer behind Blandings and Jeeves and Wooster, became an unknowing propaganda tool for the Nazis. In the summer of 1940, P.G. Wodehouse (Tim Pigott-Smith) is living in Le Touquet, France, with his wife Ethel (Zoe Wanamaker). When the German army descends upon France, Wodehouse is arrested and held prisoner in an internment camp in Tost, Upper Silesia. Throughout his imprisonment, Wodehouse keeps an account of his experiences; amusing his fellow inmates with his witty observations, the like of which had already made him a successful and much loved writer the world over. However, the German Foreign Ministry soon comes up with the idea that Wodehouse may be convinced to broadcast on the Radio to ostensibly soften the image of the Third Reich. Wodehouse’s compliance with the request lands him in a firestorm back home, where he is condemned as a traitor by the press and the political establishment. With accusations of treachery brought to him by a young Malcolm Muggeridge (Julian Rhind-Tutt), Wodehouse and Ethel are forced into exile in America, never to set foot on British soil again. The 75 minute drama is being produced by Great Meadow Productions, with Robert Cooper and Stephen Wright serving as executive poducers and Tim Fywell on board as director. The first season of Sky1′s newest original comedy series A Touch of Cloth will premiere on Sunday August 26th at 9pm, it has been announced. Created by Charlie Brooker, A Touch of Cloth has been described as an all-encompassing parody of every police procedural ever written and follows the exploits of DCI Jack Cloth and his partner DC Anne Oldman. Cloth is a maverick, boozeaddled, widowed loner, whose life is falling apart following the mysterious death of his wife. However the swordwielding/stroking/polishing maniacs who make up the local criminal element dont care about the grieving process and Cloth’s got to clean up his act to solve a string of grisly murders. The comedy series, which has already been renewed for a second season and a two hour TV movie, stars John Hannah, Suranne Jones, Julian Rhind-Tutt, Adrian Bower, Navin Chowdhry and Daisy Beaumont. Julian will be reappearing as Angus McCain in the second series of the BBC 2 drama The Hour. The scheming Angus McCain is now Head of Press for Macmillan, protecting the recently elected Prime Minister and the closed circle of his cabinet. Julian will be appearing as Angus McCain in a new 6 part BBC 2 drama series The Hour. 'The Hour's supporting cast includes Tim Pigott-Smith and Juliet Stevenson as Lord and Lady Elms; Anton Lesser as Clarence Fendley, the BBC's Head of News; Anna Chancellor as Lix, The Hour's brave and maverick hard-drinking foreign correspondent; Julian Rhind-Tutt as Angus McCain, the Prime Minister's eyes and ears; and Oona Chaplin as Marnie Madden, Hector's spoilt beautiful wife'. 'With a highly competitive, sharp-witted and passionate love triangle at the heart of the series, it's through the lives of enigmatic Bel and her rivals, Freddie and Hector, that viewers will witness the decade on the threshold of change – from the ruthless sexual politics behind the polite social façade of the Fifties to the revelations that redefined the world for a new generation. Over the six episodes, the interplay and intense ambitions between our rising news team play out against the backdrop of a mysterious murder and Freddie's controversial and dangerous investigation. Ben Whishaw plays Freddie Lyon, a brilliant and outspoken journalist, whose passion endlessly lands him in trouble. Getting to the truth of a story can be a dangerous and risky business and it's Bel, his contemporary and best friend, who is always there to bail him out. For Freddie, Bel is so much more as well – if only he were brave enough to tell her. Romola Garai plays Bel Rowley, spirited and ambitious and facing the most exciting and daunting challenge of her life – running The Hour. Can her passion for the truth survive the political pressure the job will bring – and will her friendship with Freddie survive her undeniable attraction to front man Hector? Dominic West plays Hector Madden, charming, charismatic – a man whose upbringing and education have instilled in him a sense of entitlement and whose glamorous young wife has the family connections to get him the job as front man on The Hour. But, beneath the confident façade, Hector has a lot to prove. Bel provides the challenge – and the spark. Ben Stephenson, Controller, Drama Commissioning, says: "The combination of Ben Whishaw as Freddie, Romola Garai as Bel and Dominic West as Hector gives us one of the most exciting casts for a British TV series in years. "Our trio crackle with sexual frisson and will bring Fifties London to life with style and complexity thanks to Abi Morgan's breathtaking scripts." Jane Featherstone, Creative Director and executive producer, Kudos Film and Television, says: "We are chuffed to bits to be working with the fantastic Abi Morgan again, this time on her first series for television. "The Hour is a stunning character-driven piece, focusing on the lives of three characters as they confront their own features for their futures while the country does the same. It's compelling, original and will make irresistible viewing." The Hour is a 6x60' drama series, commissioned by Janice Hadlow, Controller, BBC Two, and Ben Stephenson, Controller, BBC Drama Commissioning. The executive producers are Jane Featherstone, Derek Wax and Abi Morgan for Kudos Film and Television and Lucy Richer for the BBC. The producer is Ruth Kenley-Letts (Nativity) and the series will be launched by director Coky Giedroyc (The Nativity, The Virgin Queen). Filming starts today in and around the London area for three months for transmission next year. The Hour marks the latest high-profile drama Kudos has produced for the BBC, other titles include popular and award-winning series such as Spooks, Hustle, Life On Mars, Ashes To Ashes, Occupation, Lip Service and coming soon to BBC One Outcasts. MEANT TO BE is the feel-good comedy sent straight from Heaven about an affable guardian angel called WILL (Julian Rhind-Tutt) and his very human quest for true love. When “The Boss” sends news that Will is no longer needed by AMANDA (Kelly Reilly), a beautiful young architect he has protected since her childhood, he has a strange feeling, a feeling that he can’t let her go, a feeling we mortals call love. Convinced that to be with Amanda is his destiny, Will enlists the help of his best friend and fellow angel, ARCHIE (Kris Marshall), and embarks on a rebellious mission. Forfeiting his wings to become human, Will has seven days to distract Amanda’s attention from a charming Puerto Rican (Santiago Cabrera), and win her heart forever. As Will gets a crash course in life on earth, he discovers the trouble with destiny is some things are just Meant To Be. Stunning British actress, Kelly Reilly, plays the role of AMANDA, a determined young architect who has to choose between two charming, but extremely different suitors. 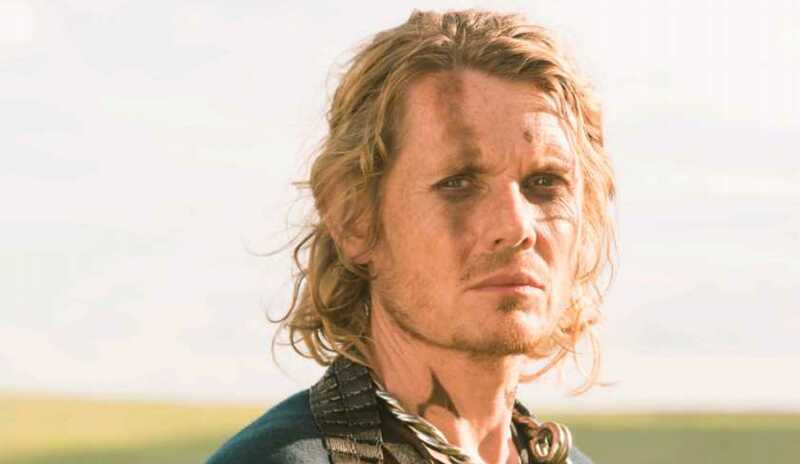 Julian Rhind-Tutt is WILL, Amanda’s guardian angel, resolute in his mission to fulfill his destiny and risk everything for the chance to be by her side. Chilean actor Santiago Cabrera, plays the irresistibly handsome and charming Puerto Rican, BEN, who proves to be tough competition in the race to win Amanda’s heart. GIGI, Amanda’s long lost friend with whom she reunites in Puerto Rico, is played by Argentinean beauty, Mia Maestro, and British favourite, Kris Marshall, takes the role of ARCHIE, Will’s heavenly best buddy. Julian will be appearing as Beauregard in this Christmas ghost story treat alongside Tom Goodman-Hill at the Hampstead Theatre. Christmas 1875. Professor Gabriel Stokes retreats to The Sea House, an old family haunt on the desolate Sussex coast. No sooner has he arrived than his peace is disturbed by mysterious goings on. He enlists the help of an American spiritualist, Tom Beauregard. Together the two embark on a terrifying journey to discover the true history of the house. Following the traditions of the finest ghost stories, Darker Shores is a gripping and shadowy tale of suspense. 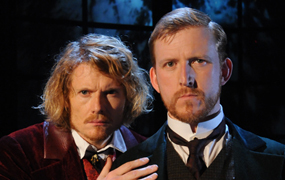 The play is written by Michael Punter and the cast includes Tom Goodman-Hill (Enron, Dr Who) and Julian Rhind-Tutt (Green Wing, Oliver Twist). Tickets are available from the box office on 020 7722 9301 or www.hampsteadtheatre.com. Julian will be appearing as Michael Garfield, an 'affable gardener' in this latest adaptation of the Agatha Christie tale. The adaptation is by Mark Gattiss, and filming is currently underway in Oxford.
' Adapted by actor, screenwriter and novelist, Mark Gatiss (Doctor Who, The League of Gentleman, Crooked House), The Hallowe’en Party, also stars Ameila Bullmore (Bellamy’s People, Ashes to Ashes), Deborah Findlay (Gunrush, Silent Witness), Georgia King (Little Dorrit, St. Trinian’s: The Legend of Fritton’s Gold), Julian Rhind-Tutt (Green Wing, Oliver Twist), Sophie Thompson (A Room With A View, EastEnders), Paul Thornley (Mutual Friends, Love Soup), Eric Sykes (The Goon Show), Fenella Woolgar (Doctor Who, Jekyll) and Timothy West (Bleak House, A Room With A View). When Mrs Ariadne Oliver (Zoë Wanamaker) attends a children's Hallowe'en party in Woodleigh Common with her friend Judith (Amelia Bullmore), a young girl Joyce Reynolds (Macy Nyman) boasts of having witnessed a murder years before. Joyce's story is heard by all the party, including her strange brother Leopold, the impeccable hostess Rowena Drake (Deborah Findlay), her bookish son Edmund (Ian Hallard) and the local Reverend Cottrell (Timothy West). Mrs Whittaker (Fenella Woolgar), the church organist, and Frances Drake (Georgina King), Rowena's feisty daughter, are dismissive of her story but later that evening Joyce is found dead having been drowned in an apple-bobbing bucket in the library. It appears that any one of the guests could have slipped out in the dark during a game of Snapdragon and drowned her. At the request of his friend, Ariadne, Hercule Poirot (David Suchet) arrives at Woodleigh Common to investigate the murder. Though local Inspector Raglan (Paul Thornley) dismisses Joyce's claim and even her step-mother Mrs Reynolds (Sophie Thompson) admits her daughter was a liar, Poirot is convinced Joyce's story has some truth to it. When he seeks out the local gossip, charwoman Mrs Goodbody (Paola Dionisotti), Poirot discovers that there have been a number of suspicious deaths in the village in recent years which Joyce could have witnessed: a drowned school teacher, a stabbed solicitor's clerk and the passing of a rich old lady. Mrs Goodbody is convinced that old curses still haunt the village, as is the affable gardener, Michael Garfield (Julian Rhind-Tutt). But while Poirot pieces together the facts, another child is found drowned in the river. Could a forged codicil, a missing au pair and a secret love affair be the key to solving the crime? Perhaps the former solicitor of Mrs Llewelyn-Smythe (Phyllida Law), Mr Fullerton (Eric Sykes), holds the key to the mystery, but can Poirot act in time to save Judith's ethereal daughter Miranda (Mary Higgins) when he realises she is in danger? The Hallowe’en Party is currently being filmed on location in Oxford. It is directed by Charles Palmer and the producer is Karen Thrussell (Agatha Christie’s Marple). The Poirot films are co-produced by ITV Studios and Agatha Christie Ltd, a Chorion company, and US network WGBH. Mammoth Screen’s Michele Buck and Damien Timmer executive produce Poirot on behalf of ITV Studios. Rebecca Eaton is executive producer for WGBH, with David Suchet as associate producer. ITV Global holds international distribution rights.' (www.itvmedia.co.uk/inside-itv/itv-news/david-suchet-and-zoe-wanamaker-reunite-in-the-halloween-party).